So Shôn Dale-Jones is staring at me, and he’s just told me to f*ck off. In fact, he’s staring at everyone. And he’s told everyone to f*ck off. And in the awesome silence that proceeded, the guy infront of me leans down and pulls out a handful of sweets from a less than quiet bag, and I can’t help but stifle a laugh. This was not how I was expecting my Tuesday evening to turn out. Before launching into any conversation about Me & Robin Hood and I’ve got to make a confession. I don’t really like theatre that much. I mean, I do, but I don’t often come away from a show without even a tiny gripe of some sort. And, as most of the people who know me will attest, more of often than not I come away borderline angry. So, understand that I don’t say what I’m about to say about Me & Robin Hood very often. Me & Robin Hood never even comes close to this, and yes, is often genuinely challenging and confronting. I don’t want to give away too much, because I feel it might detract from anyone who might go and see the show, but through his personal relationship with money, Dale-Jones takes us on a kaleidoscopic exploration of the ways in which money controls out lives. And how those who guard the systems in which the money flows are nothing more than a bunch of Sheriff of Nottinghams. 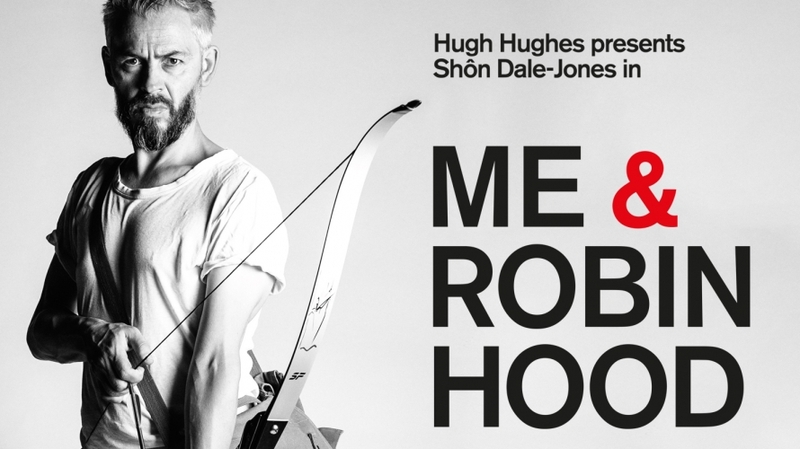 The story of Robin Hood and anecdotes of Hugh Hughes’s childhood and current day shenanigans (real, fiction, or with a dash of both, you decide) are masterfully weaved together on a stage bare except for the bottle of water from which he periodically sips. Nothing is sacred theatrically here either. Dale-Jones knows who is audience is. He knows that we’re probably middle class, and pretty well educated. He doesn’t blame us for it, but he does turn it back on us. He gives us the figures of the amount of homeless and deprived children in the world, and then a few lines later tells us to f*ck off. To stop congratulating our own compassion, our ability to watch and feel. To actually take some action. Like Robin Hood, and his band of Merry Men. It isn’t often that theatre can get like this. Our polite sensibilities are not protected. Dale wants to provoke and laughs at us for thinking how clever we are. To summarise, Me & Robin Hood is less a ‘theatrical exploration’, more of an impassioned morality tale about the power of money, and the importance of human relationships. It could be preachy, and it could be self-congratulatory, and sometimes comes close, but Dale-Jones ultimately pulls it off with humour, a wonderfully crafted script and a captivating performance. Go and see it. It’s worth it.